Create your own custom autorun menus, interactive presentations, multimedia applications, and custom software in just minutes. 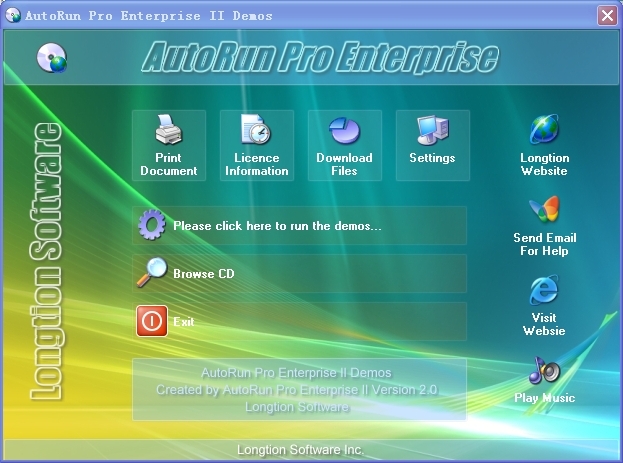 AutoRun Pro Enterprise II features a completely visual drag and drop environment. Simply add content such as buttons, photos and text to your pages and position them using your mouse. Even if you have absolutely no programming experience you'll be able to get started creating your own custom applications in just minutes. The best in AutoRun Pro Enterprise II is that it has been designed with the ordinary user in mind, the one who doesn't want to take the time to learn how to use a complicated design tool or hire a designer to do the work. It lets you create and edit a front-end in much the same way as you would design a presentation in Microsoft PowerPoint. Just click, drag, position in the desired area and preview to see whether you have the intended result. In just a few clicks, you can create a main page, a splash screen, an agreement form, a security form and an exit form, plus add the unlimited number of sub pages. Pages can be connected by using transition effects like page fade in, fade out and others. You can elaborate pages by adding buttons, images, simple text, links and many other objects and associate each of them with actions so that end users can interact with and navigate through the front-end content. The front-end can let them open and execute files, print documents, send email, visit web sites, browse CD and more. 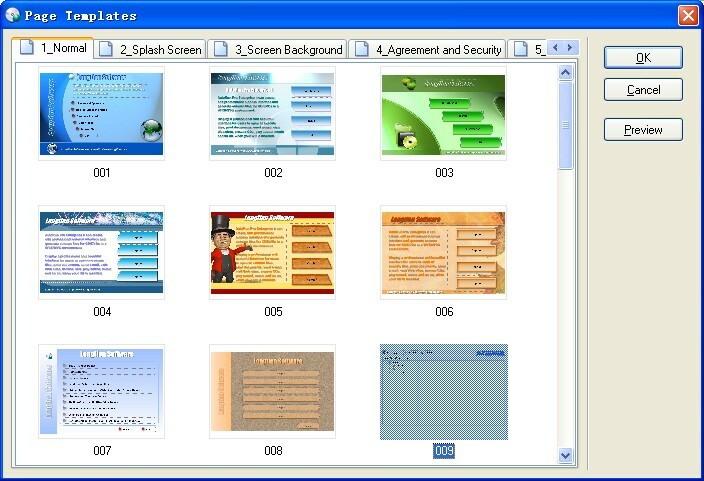 AutoRun Pro Enterprise II is a powerful visual tool to create professional autorun (autoplay) interfaces and presentations for your CD/DVDs. It is the easiest way to create, edit professional autorun (autoplay) interface and generate autorun files for CD/DVDs in a WYSIWYG environment, just click, point, place and test (preview). So all is visual, fast, simple. AutoRun Pro is easy to learn, with demos and wizards you can get started in just minutes! 36 Objects: Panel, TabNotebook, TabSheet, GroupBox, ScrollBox, Splitter, Button, ImageButton, Image, Bevel, SimpleText, ScrollText, Link, FadeButton, Label, Text, Shape, Balloon, Note, ListBox, DropDownList, ListView, TreeView, ShellListView, ShellTreeView, TextBox, RichText, Browser, MediaPlayer, PDFReader, FlashPlayer, SlideShow, Edit, UserPassword, CheckBox and RadioButton. ScrollBox, Panel, TabNotebook, TabSheet, GroupBox are container objects. The container object can serve as a container (parent) for other objects. The parent of an object is the object that contains the object. For example, if a page includes three RadioButton objects in a GroupBox object, the GroupBox object is the parent of the three RadioButton objects, and the RadioButton objects are the child objects of the GroupBox object. It's fast and easy to use. 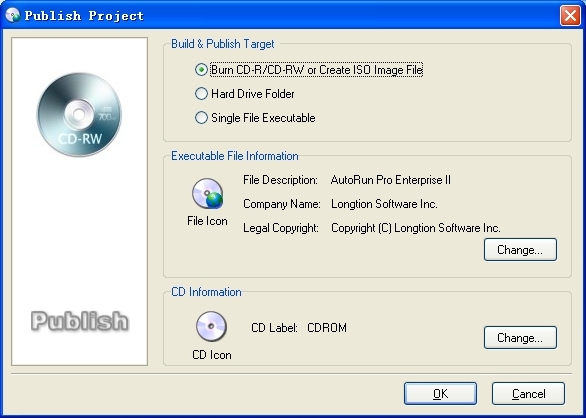 Anyone can quickly create autorun CD-ROMs within minutes. Display of every registered document (e.g. : TXT, DOC, HTML) via automatic start of the corresponding application. Print of every registered document (e.g. : TXT, DOC, HTML) via automatic start of the corresponding application. Start the default browser with document URL. Integrated Web browser and internal commands. Integrated RTF (Rich Text) viewer. Slide Show images (Photo album), more than 100 styles. Background color, Gradient color and Transparent Form. Splash screen, splash screen sound. Full screen background and logo image. Using the drag-and-drop interface to link files for opening documents and running executable programs. CD Icon and Page icon can be displayed in the title bar. Burn project to CD-R/CD-RW directly with built-in CD Burner. Create a single executable file. Publish project to new folder. Create ISO CD-ROM image file. Install Software - You may want to install a default viewer for the files if the user does not have one on his computer. For example, if you are launching a PDF file, you may want to include Adobe Acrobat Reader software on your CD and install it if the user does not already have it installed. You can define one or more files to be installed. CD expire date, Specifies an expiration date for the CDs. Set object(s) Enable or Disable, Show or Hide Object(s). Runs from CD-ROM without installation.